How Would the World be without the IBM PC? Of all those who have ever heaped praise on Apple’s products, none have been as loud as Apple itself. The company has a knack for grandiose hyperbole, describing every small feature or new product it releases as a revolutionary game-changer. Among tech fans and pundits, arguments about Apple’s revolutionary nature are more common. You can say what you will about Apple's own self-importance, but there is little debate that Steve Jobs, has legitimately been responsible--at least in part--for many products that have truly changed the direction of the tech industry. Now, with Jobs stepping down as Apple CEO, presumably because his health is failing to the point where he can’t fulfill that role anymore, who will drive the industry forward in Apple's signature manner? Before we try to answer that question, a look back Apple's innovations under Jobs. We all know about the original Apple computer, and the Apple II that succeeded it: harbingers of an age of personal, rather than corporate, computing. It is not an exaggeration to say that Jobs helped invent the PC. Apple’s ill-fated Lisa became the first commercial computer to ship with a GUI, though it took the Macintosh to popularize it. The Newton brought us a PDA years before the Palm Pilot, and years before the world was ready for one. Candy-colored iMacs pushed the all-in-one PC concept before we even had flat LCD monitors. The iPod by no means invented the portable MP3 player, but it made it usable. Smartphones existed before the iPhone, but it took Apple’s--and Jobs’--vision to figure out how to make them into something everyone would want to use. The same goes for the iPad, a device that certainly wasn’t the first tablet, just the first tablet people actually wanted to use. Let us not forget innovations like the LaserWriter, which brought such high-quality printing to the masses that it almost single-handedly revolutionized the desktop publishing industry. The influence of Jobs and Apple, in its successes and its flops, has spread far and wide throughout the tech industry. Let me put it this way: How many white headphones were there before the iPod? I wrote recently about the struggle of PC manufacturers to catch up to the popular MacBook Air, and how this is just another symptom of a larger problem with lack of innovation in the tech industry. Jobs resisted the commoditization that gave us lower prices but boring products, produced with mass-market components and crammed into just another plastic case. Call it vision, hubris, or force of will, but Jobs truly understood the value of designing the whole product, even when that meant inventing new parts. He knew when to keep driving at a good idea, even if it didn’t take off right away. In the short term, the absence of Jobs from day-to-day operations at Apple will not make much of a difference. Major projects take years to reach the market, and Apple surely has many new goodies in advanced stages of development. The long-term effect of a tech industry without Jobs could be chilling, though. Would Android be what it is today if the iPhone didn’t take the world by storm? Android was acquired by Google in 2005 and didn’t release on a phone until 2008; it’s widely reported that the iPhone caused the team to go back to the drawing board. It was a Windows Mobile killer, but iPhone changed the game. Would Android tablets even exist if the iPad was never released? We’re already arguing about whether or not we’re in a post-PC world, and none of this stuff was on anyone’s radar until Apple started selling tens of millions of ‘em a few years ago. Can Jobs' Big Shoes Be Filled? The resignation of Jobs puts the onus to popularize innovative products on someone else. It is unclear who that someone might be after surveying today's tech CEO landscape. Steve Ballmer lacks the vision to bring about the kind of influential products Bill Gates did. It might have been J Allard, if he didn’t leave the company. 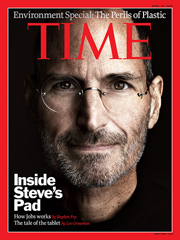 Who will be the new Steve Jobs? Will it be Apple’s Tim Cook or Johnny Ive? Microsoft’s Joe Belfiore? Can Google, a company that does “better” very well, turn into a company that does “new” as well as Apple did? Or, will we see the rise of a new tech company, small and agile at first, delivering products and experiences we won’t even know we needed until we have them?